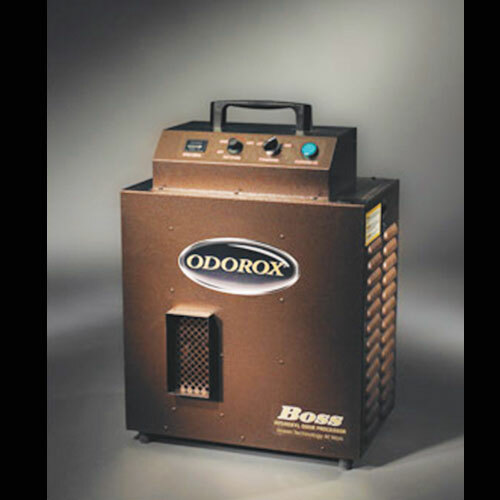 The ODOROX® Boss™ unit is the right choice for the professional fire and water damage restoration contractor. It can deodorize and decontaminate up to 2000 sq.ft. The ODOROX® Boss™ unit is designed for heavy concentration processing and operates using only 1.9 amps. The BossTM unit is equipped with a selector switch for 1 or 2 ODOROX® hydroxyl generating optics and a washable filter. The built-in fan is adjustable from approximately 250 to 500 cfm which makes this unit very versatile. Turn the fan to low to deodorize small areas such as cars, RVs, boats, bedrooms or offices. This setting is also ideal for tenting damaged contents on-site. Turn the fan to high and you have the ability to treat larger areas such as basements, homes and businesses. ODOROX®, Boss™ and HGI Industries Inc. are either registered trademarks or trademarks of HGI Industries Inc. of Boynton Beach, Florida USA. Other trademarks are pending in the U.S. and other countries.